A new Koenigseggeggegg Agera is on the way. 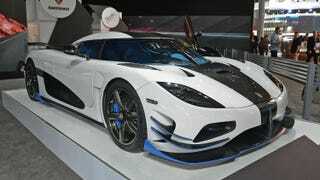 Called the Koenigseggeggegg Agera RS1, It’s twin-turbo 5.0 liter V8 has 1,360 hp and does 0 to 60 in 2.8 seconds. This is one of 25 Agera RS models, all of which are already sold.